Sean Rowley began the night in the 150 capacity Hammersmith Working Men’s Club in 2004 and, discovering he was not alone in his love for ELO and Hall & Oates, moved the night to the Islington Academy where it resided for 2005 culminating in a Christmas party which saw Charlotte Church and Terry Hall take to the stage to sing. (Rowley 2007). I would also like to consider it under the light of 'kitsch’ the discussion of which Theodor Adorno sets out in his essay of the same name written in 1932; it concerns itself with bringing the past into the present in an effort to ameliorate the here and now. In particular I would like to explore what Adorno means when he talks of a “forgotten secret” (2002b: 501), how this relates to history and what this might mean for Guilty Pleasures and its listener. I shall also provide an analysis of kitsch music as an ideological formulae, in that it can be considered to be the construction of a myth. I will be doing this with the help of Roland Barthes and his essay 'Myth Today' (1957). Whilst Adorno has much of value to say about history, and how music works in an ideological sense, Barthes describes the interpellant moment when the listener is hooked by the myth in a specifically individualised way. It will become clear as this blog progresses why this personal aspect is particularly important for an analysis of Guilty Pleasures. The Oxford English Dictionary (OED) describes ‘kitsch’ as: “Art or objets d'art characterized by worthless pretentiousness; the qualities associated with such art or artefacts.” This definition implies that the artwork is pretending to be something that it is not, whereas the common usage of ‘kitsch’ today is often aligned with the art not pretending to be something it is not and, in a sense, setting itself up clearly as an object to be seen for what it is, in all its mocking superficiality. There are entries in the OED which are likely to be more in line with Adorno’s thinking on kitsch, for example “Kitsch is mechanical and operates by formulas. [...] is vicarious experiences and faked sensations. [...] The more romantic a work of art, or a landscape, the quicker its repetitions are perceived as kitsch or ‘slush’.” Also, there is an alternative meaning offered by the OED: “to render worthless, to affect with sentimentality and vulgarity”. In Adorno’s introduction to his essay 'Kitsch' he states that the etymology of the word ‘kitsch’ is in the english word ‘sketch’ and he explains this as “the quality of becoming unrealized, merely hinted at.” (2002b: 501), although this connection to 'sketch' is not noted in the OED. It seems that 'kistch' is a slippery term, the use of which has changed over time. In music, at any rate, all real kitsch has the character of a model. It offers the outline and draft of objectively compelling, pre-established forms that have lost their content in history, and for which the unfettered artist, cast adrift, is not able to fashion the content on his own. (ibid). This notion of the refashioning of history is particularly important here because it is what provides the ideological aspect of what culture, or a cultural object, can represent. And, what is most pertinent to Guilty Pleasures is what and whose history is being represented. I believe that in its entirety Guilty Pleasures represents history (the past): different social histories contained in the individual songs from yesteryear, and alternative subjective histories for the individual listeners of those songs. The songs do contain something of the concrete realities of their moment of production; they will represent the socio-political period from which they emanate, and will say something about the artist and the industry of that time (even if this may not be apparent in a superficial listening). They will also have the personal history of the listener wrapped up in the song: what that song meant to them at that time, what it represents to them as an individual, today and yesterday. In its original incarnation Guilty Pleasures was oriented around the 'seventies'. This is apparent in the content of the first album, released in 2004 (appendix 1: 22). The track listing contains, for example, Carole Bayer Sayer’s You’re Moving Out, David Essex's Gonna Make You a Star and Pilot’s January. In terms of subjective memory these songs will have meaning to those who lived in Britain in the 1970s. Whilst the 50-something person of today (the popular music enthusiast of the seventies) is likely to be the purchaser of this compilation, they are unlikely to be the club-goer of the Guilty Pleasures clubnight. The Guilty Pleasures machinery is wise to this, having evolved the brand so that it includes contemporary guilty pleasures in order to appease today’s young audience of clubbers. In the autumn of 2008 the University of Leeds had their first Guilty Pleasures clubnight, which did not play one song contained on the first album, but included such contemporary guilty pleasures as Take That’s 2007 hit Shine along with a number of eighties ‘classics’, including Prince and Michael Jackson, which may appear in the collective memory of the university student of today. Guilty Pleasures means different things to different people, what is common to the listener/dancer is that Guilty Pleasures is always about ‘the past’ and the bringing of that past into the present. A ripping of the past from its original roots and re-presenting it to the music listener of today: “Things that were part of the art of a former time [...]” (Adorno 2002b: 501). So as to further demonstrate how context and history are important to the concept of 'kistch' for Adorno, I shall provide a contemporary example from the Guilty Pleasures clubnight at the University of Leeds on November 1st 2008. During the evening Sean Rowley played a dance mix known as destiny's child . independent women part 1 (a capella) 10cc . dreadlock holiday by 2 many djs (2002) (for brevity I shall be referring to it hereon in as Independent Women vs. Dreadlock Holiday, which it is often known as). As the title implies this is, in the main, a hybrid of Destiny Child's Independent Woman (2001) and 10cc's Dreadlock Holiday (1978). Whilst Destiny Child are a recent group (in the history of popular music, anyway), 10cc are a seventies band and could be considered to be securely rooted in the past. It would be surprising to find any of the club-goers on that night not being familiar with the original hit Independant Woman, it not being in the too distant past for them. But, it is quite likely that for most clubbers that this could be the only context in which they have heard the 10cc mock-reggae tune. Having been present at this clubnight, I was well aware that the primarily student clubber recognised the song we were dancing to. I had not heard this particular version of Dreadlock Holiday before and only knew the original. This made me very aware that my experience of it would be different from most others attending the club. Whilst all of us as individuals have our own memories attached to particular songs – songs are very powerful in the way that you get transported back to your past upon listening to a recognisable tune – the songs themselves also have a concrete cultural and social history attached to them. Dreadlock Holiday reminds me of high school and the period when I was taking my A'Levels, but in Britain 1978 was also the year when the British Carribean colony Dominica was given independence and when the first man in cricketing history, Ian Botham, scored a 'century'. I am not suggesting that 10cc were making these political connections in their lyrics when they refer to 'cricket' and 'reggae', rather more I am stating that songs have a cultural-social-political significance and even, perhaps, unintentionally represent something of the historical period of which they emanate. In a sense, all old song hold a kind of historical memory within them, a trace of the past; although it is likely that it can become distorted. It is this memory that I will turn to in the next part of the blog, in relation to what Adorno means when he says that kitsch hangs onto a disformed and illusory memory of the past (ibid.). Why Does She Stand on One Leg? You can watch the advert here - Best Ads On TV - or read the description below. Please scroll down for the semiological critique itself. While much could be said about the stylish young woman, the Louis XIV-style packaging (and the French emphasis in general) and also the colour signifiers in the advert, I am going to focus on three elements: the standing-on-one-leg trope, the term ‘bof’ and the aesthetics implied by two filmic references. The first two motifs I will discuss in a broad cultural sense, since they represent the brand directly, the other I would like to include for its connotative reference, because I think it is stylistic but at the same time means the advert could reach an audience other than its main one (female ‘twenty-thirty something’ cocktail drinker). While it might be obvious to state that the single-leg motif could refer to ‘legless’, this does not reflect the subtle nature of what is implied by standing on one leg. In modern culture we can think of ballerinas, gymnasts and horses in dressage. So standing-on-one-leg refers to skill, beauty, dexterity and achievement. These sports, if you will, are also what could be described as middle- or even upper-class, so this drink could be seen as being ‘aspirational’, despite, and indeed because of, its reasonable price. The drink is presented as ‘classy’, not least because of the history of the drink, although there is some irony contained in this since, if you follow the lineage of Louis XIV, it ended in 1775 with the French Revolution, one of its main aims being to rid France of the aristocracy (the upper classes). Bof! The term ‘bof’ generally has two meanings, both relevant to the advert. It is urban slang directed at people who want to be different, but it is also French for ‘I do not know’ in the sense of disinterest. 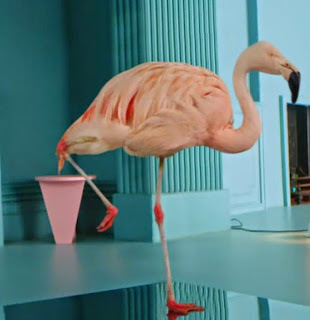 The ‘I do not know’ refers to both the question of why the girl/flamingo stands on one leg, but also to a disinterest in why they do, because it is irrelevant – they just do. What is important is Chambord, not the standing-on-one-leg. Of course, this standing-on-one-leg is about being different (quirky). Being different is desirable. Who wants to be like everyone else? Being different = Chambord = being interesting/quirky, but also being desirable because of that, nevertheless. The last point I would like to bring up are the Kubrick references. The opening music sounds like it is sampled from A Clockwork Orange (if it is not it is characteristic of the style of the track ‘The Funeral of Queen Mary’ from the film). Also, the monochrome room, which we see more of at the end of the advert, is redolent of the ‘bedroom encounter’ scene in 2001: A Space Odyssey (a Louis XIV-style bedroom). 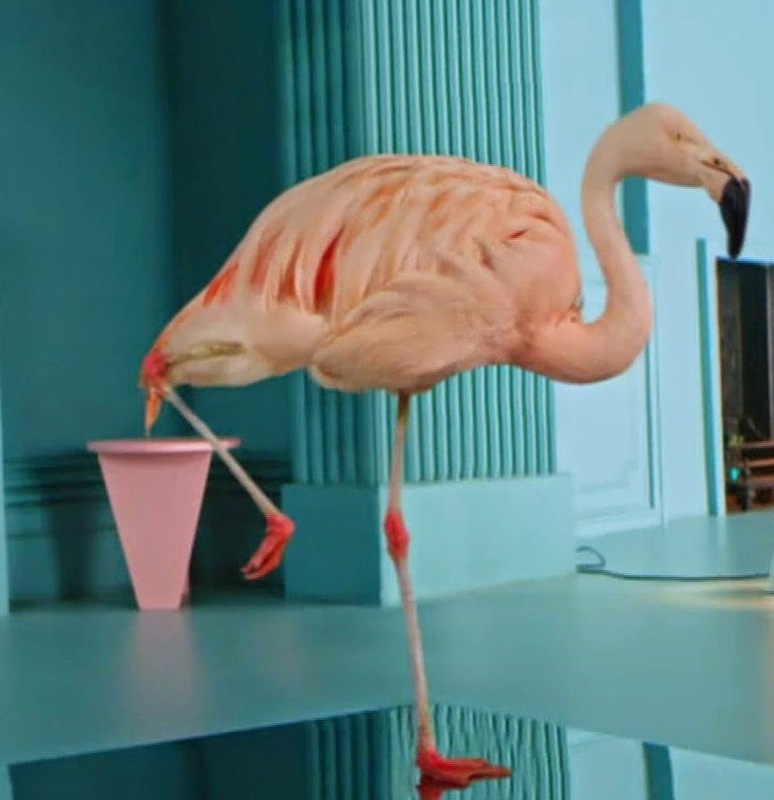 While these may just be stylistic affects included in the advert to make it fit a certain aesthetic, they do more than that (while also telling you something about the designers of the advert, too – such as, perhaps, their age, but also their interest in cinema). These Kubrick references add an edginess to the film – especially the music, which, in a way, is at odds with the visuals – they are mostly soft and pastel in colour. But, also, they open up the advert to another group of potential customers: women (and perhaps men) of an age who would be familiar with these films (1968 and 1971), and also film buffs. I appreciate that these additional references may be connotative, but since the aim of advertising is to make it personal to the potential consumer, this advert does that for me. As Roland Barthes explains, the power of the connotative is that it speaks directly to you and appears as if it has been placed there just for you! 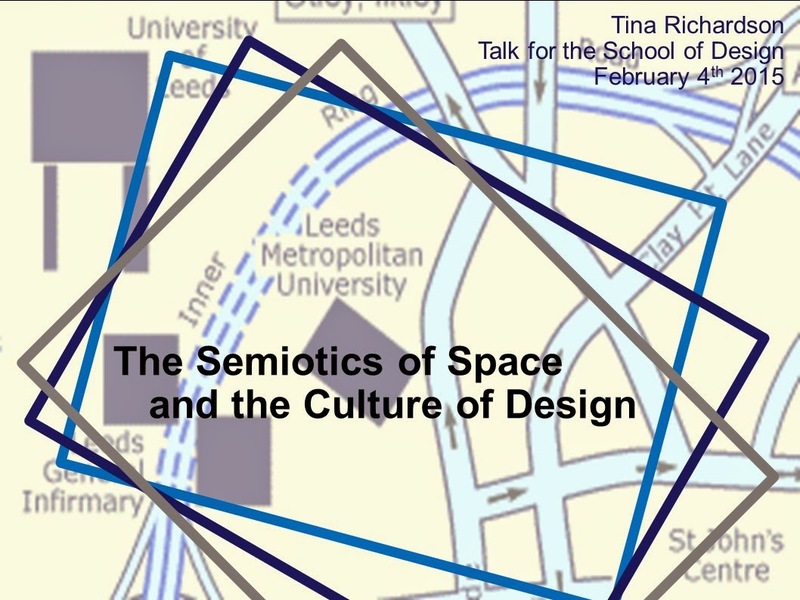 This talk looks at how design influences the development of, and our perceptions of, space. By taking two examples, an architectural plan and a wayfinding device, Tina demonstrates how design can project a future space through the imagination of the designers, one that becomes concretised through a particular discourse. She also provides the example of a map in order to unpick how design elements and motifs can be read as signs that speak about specific ideological agendas that might not be obvious on a cursory viewing. The examples she will be discussing represent a place that will be very familiar to you, the campus at the University of Leeds. Tina Richardson is an independent scholar in the field of Urban Cultural Studies. She specialises in psychogeography, the aesthetics of urban space and the postmodern city. 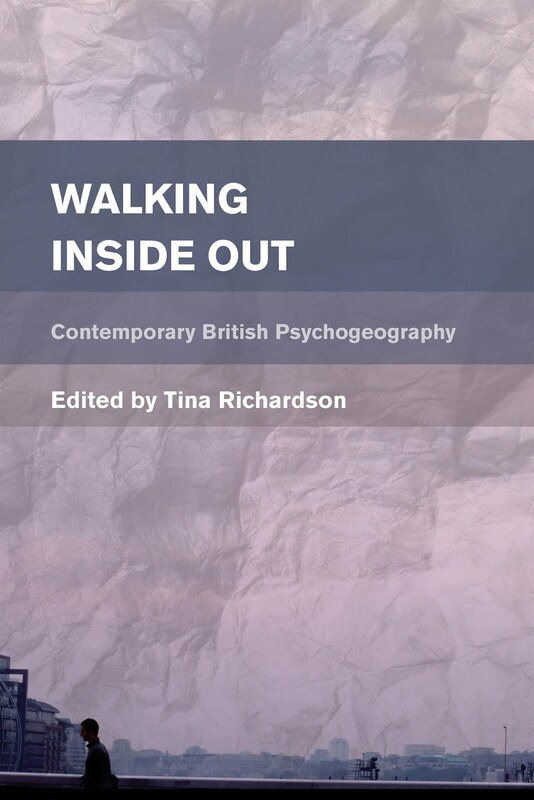 Completing her PhD at the University of Leeds in 2014, she is now guest lecturing while finishing her book - Walking Inside Out – which will be published in July 2015.